I have a surplus of carrots lately. Dad’s been eating them raw and in stews and in salads and then finally asked if I could do anything with them. Bake at 400 ’til done (20ish minutes). I made these before heading heading out of town for the weekend. I left on Friday. All muffins were gone by Monday. 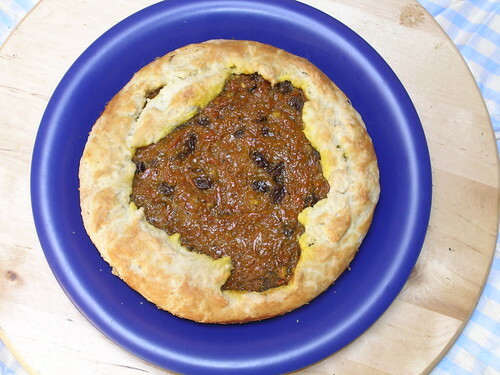 My next idea was a savory carrot galette, based on Smitten Kitchen’s Zucchini and Ricotta Galette. That’s still on the horizon. But first came this. When I was a kid, I read a Bugs Bunny book that made mention of a county fair carrot pie-eating contest. I’ve wanted to try a sweet carrot pie since then. This was my first attempt at making one. For the crust, I used the galette crust recipe from Smitten Kitchen (modified by the addition of 3 or 4 tablespoons of sugar). The idea for the filling came from a carrot dessert I’ve had at Indian restaurants: gajar halwa. Mix dry ingredients. Cut in the butter. Then mix wet ingredients, and add them to the dry ingredients. When it’s all come together, cover with plastic wrap and refrigerate for an hour. To make the filling, I put all ingredients into a saucepan and let them bubble away until it seemed the flavors had come together, or the sauce was thick enough, or the carrots were soft enough, or something. Then I pulled out the cinnamon stick and added a tablespoon of corn starch (mixed with a little cold water) and let it thicken up some more. Then I took the pan off the heat and let the filling cool while the oven pre-heated and I figured out the rolling out of the dough. Usually, my attempts to roll out pie dough end in tears (and tears). This time, I tried something new: I (a) was generous in flouring the board, and (b) rotated the dough a quarter turn between rolls. The process wasn’t perfect, but I did manage to get the dough into a pie pan without breaking it. We call that a success. I poured the cooled filling into the dough, spread it out so it was even, and fold the sides of the dough over the exposed perimeter of filling. 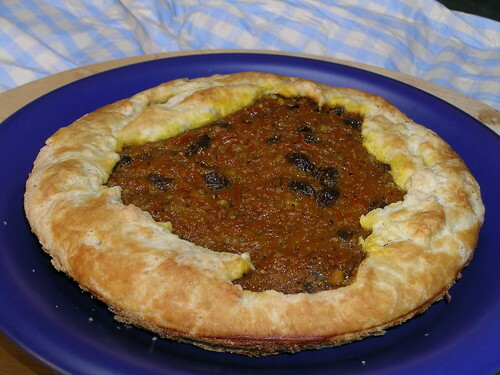 Then the galette was baked at 350 until the crust was golden. 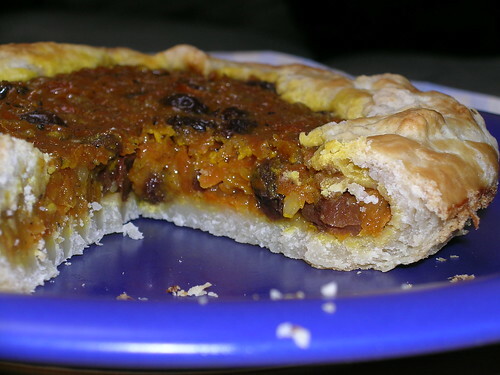 This entry was posted in baking, dessert, muffins/quick bread, pies/tarts and tagged carrots, Muffin, Tart, vegetables. Bookmark the permalink. 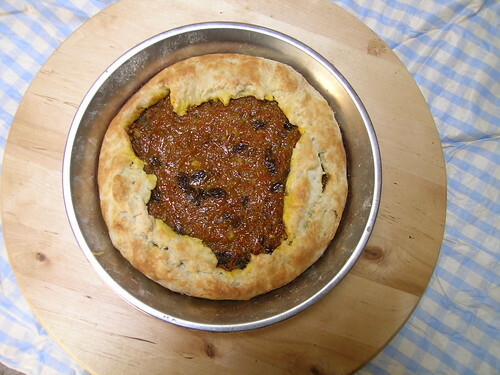 I love a galette and this is an interesting filling.